WIN a Frywall of your very own, SHARE this post on Facebook before Saturday, September 24th by midnight! I love to fry food. I watched Yair, and the two of us talked about this blog, me frying, Italian foods, bacon, and tofu. It’s an art, frying – you have to know what you’re doing to get that perfect crispiness on the outside and moistness on the inside. One key to frying is to ‘dry’ whatever you are frying up – the drier, the better. Home-cut french fries are a great example – pat them dry thoroughly and repeatedly before frying in hot oil. But, alas, as much as I love frying things, I don’t do it as often because a). You have to eat fried food in moderation b). It stinks up the apartment c). It uses a lot of oil d). It’s messy. I was pleasantly surprised to see that Frywall improved several of these personal concerns. And don’t let the name deceive you – after trying it, I am inspired to look for healthy alternatives to frying that are still ‘like frying,’ as well as take full advantage of searing. Mix together all the ingredients (except the cauliflower and egg, of course). Dip each cauliflower piece into the egg wash, then coat fully with the breadcrumb mixture. Set on a plate lined with papertowels and place in the refrigerator for about 10 minutes. Insert Frywall into you pan, per the product instructions. Add canola or vegetable oil to just above the bottom rim. 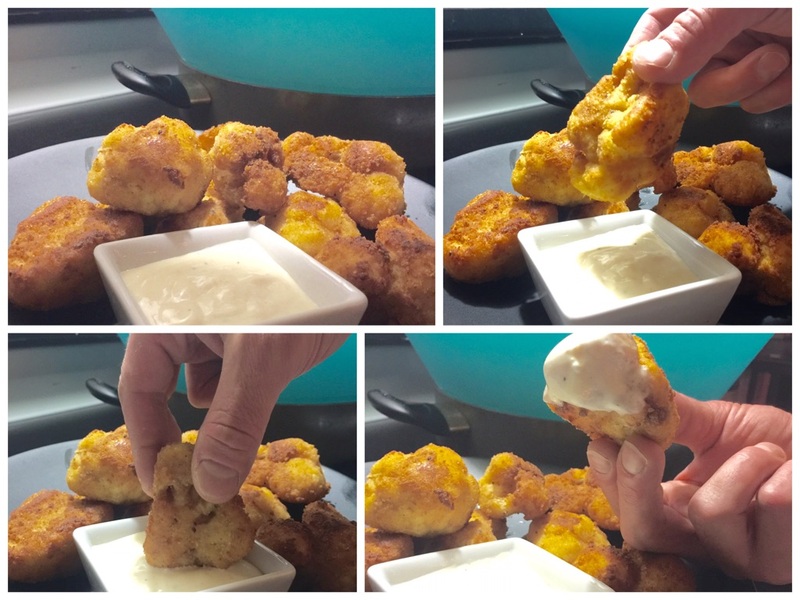 Add cauliflower pieces and fry each side about 3-4 minutes, then continue frying until golden brown. Remove from oil and place on a papertowel lined plate to absorb any excess oil. Notice in the above image how Frywall catches splatter and maintains a cleaner stovetop. Odor was minimal, and it almost looked as though it was ‘steam frying.’ I used less oil than a deep fryer with better results. They literally fried up perfectly – what a difference the benefits make – I was a little worried at first – I was like, “what’s all this foam?! ?” Then I realized moisture was releasing the right way. Let your imagination run wild for a dipping sauce – blue cheese is a favorite in my house, so decision making was simple. Alternatives: marinara, ranch, beer cheese, ketchup, honey mustard, lemon juice…whatever, enjoy yourself, indulge every once-in-a-while in fried up, homemade goodness. These are great as a starter for a dinner party or on a platter of apps for football season. If you make them earlier in the day or day before, just place on a cookie sheet and heat for about 10 minutes at 350 before serving. For your chance to WIN a Frywall of your very own, SHARE this post on Facebook to enter the latest giveaway (click the Facebook icon below)! TWO lucky winners will each receive either a Frywall 10 or a Frywall 12 in your choice of available colors! I proudly backed Yair’s Kickstarter campaign, which was successfully funded on August 25th!